Zakaria outlines a speech for Obama on the subject here. These reversals of strategy have had the effect of creating what General Petraeus calls ‘breathing space’ for political reconciliation. And he has always said that without political progress in Iraq, military efforts will not produce any lasting success. “He is right. All today’s gains could disappear when American troops leave—and they will have to leave one day. The disagreement I have with the Bush administration is that it seems to believe that time will magically make these gains endure. It won’t. Without political progress, once the United States reduces its forces, the old mistrust and the old militias will rise up again. Only genuine political power-sharing will create a government and an Army that are seen as national and not sectarian. And that, in turn, is the only path to make Iraq viable without a large American military presence. In other words, Zakaria is advocating a policy of conditional engagement. FYI: Colin Kahl author of the policy is an Obama adviser. While a part of me leans to the William Odom rebuttal (same piece linked above) that is not politically feasible in US politics (see Democratic Nominee Bill Richardson for proof). I also tend to lean towards a Biden federalization plan outlook (Obama so far has not and Zakaria’s speech correctly reflects that fact). My fear is a combination of the (by me) italicized passage as fundamentally correct as well as the inability of the US to help broker political progress (Odom’s point as well William Lind’s). Meaning the inevitability of the return (they never really left) of the militias. Nevertheless, still sane points in Zakaria’s approach. One point that would add strength to the speech is a call for no permanent bases. I’m not a fan of book titles that begin with the word The. A postmodern trick often helpful is to pluralize thereby neutralizing the definitive for all timenesss of THE, e.g. The Post-American Worlds. Also of course the book is not about a literal post-American world. Like some Vonnegut novel where someone deploys a neutron bomb that destroys all of and only American plus all Americans not in America at the time of the drop. Nor is it some Alex Jones argument about how some North American Union is going to take over the US. [Incidentally if such does occur and the global elite do create that giant superhighway and heard us all into giant ghettos I want a better named currency of my oppression that an f’in amero). It’s not even an argument that the US is in decline per se, but rather that others (esp. China and India) are rising plus the increased economic power of the EU. Russia with gas and oil in the mix as well. 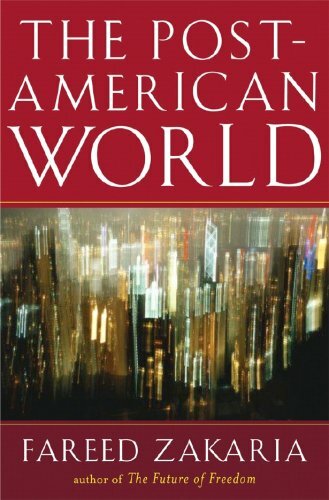 It should really be titled The Post-Unipolar Hegemonic American Worlds. Sounds much more exciting yes? It’s a good plane read. Finished it from Houston to Vancouver (along with seeing Definitely, Maybe which was a decent flick). It’s interesting that Obama again signaled his interest in a George HW Bush-like foreign policy. Maybe he sees himself like HW transitioning from to the Post American World (a la Bush and the Cold War world). Don’t know. Or he sees the increased need for diplomacy, fox-ness, and nimble maneuverability in this world. The book is worth the read and I think is fundamentally correct. Even if he got where’s the world’s largest casino is at wrong. It’s obviously a wide-angle lens and isn’t as much detail on more national economic policy say–e.g. the intricacies of the centrist versus from left-wing economists in the Democratic Party and the latter having more energy and momentum in the current economic mess. More on that in a separate post. But the key definition for why Post American is that it’s more clear what we are leaving (Pax Americana) then it is where we are heading. When that becomes more clear (whenever that occurs) someone will have to come up with a new name. The best criticism as I said before is probably Thomas PM Barnett’s, which is that the book could use more in the way of policy and politics (how to convince) for US strategy in this new reality. There is some but it could definitely be filled out. Barnett’s book is aiming to do that. Unless of course John Robb is right and the whole nation-state order is going to collapse via open source insurgencies (military and financial), black swans (probably environmental in nature), and cascading crashes. In that case, it won’t be a Post American World it’ll be a Post-Everybody World (aka Everybody minus a Milita is F—ed) Think now about how you want yours to look and who is going to be in it. Just to be clear (if it sounds like I’m being too cute by half) I actually have moments of not being able to sleep at night thinking he could very well be right. There is a really interesting discussion for foreign policy big-strategy nerds (like myself) going on at TPMCafe on Fareed Zakaria’s new book: PostAmerican World. I stand by my observation that what Anne-Marie and John Ikenberry call the postwar liberal international order was in fact two distinct orders. Plan A–the UN, Bretton Woods, the Four (or Five) Policemen–was reluctantly set aside in favor of a hastily improvised but ultimately successful Plan B–NATO, the Marshall Plan, what became the EU–when the Soviet Union chose to act as a revisionist power instead of a status quo power after 1945. The upshot of which is that by the standards of Plan A, Russia and China today would qualify as upholding the terms of the non-aggressive powers standard. Whereas since Kosovo and now Iraq, many in the US, some in Europe (e.g. Tony Blair) have moved to want to force the world into Plan B. By that standard Russia and China (and other powers presumably) fail, and therefore a Concert of Democracies are created to push towards this reality and/or circumvent the UN (Plan A writ large) when it fails to uphold the standards of Plan B. Very interesting argument. What is needed then I would say is something that splits the difference–I’ve never bought into this Concert of Democracies stuff. I would rather expand the G8 and use that as the primary multi-lateral institution (betraying my Plan A preferences/roots). Thomas Barnett is writing the Third Volume of his books. That post details how he thinks his book might fill that slot: namely on the one hand agreeing basically with Zakaria and Lind about the international order (contra neoconservatives) and yet finds a role for the US practically to influence and operate within that order. I do however stand on record to being more open to The League of Democracies if they create a Hall of Justice.